The front of the rally in Silchar on Tuesday. Silchar: The hub of Barak Valley, Silchar, today witnessed a large rally of the civil society against the discrepancies in the update of National Register of Citizens (NRC). On 2 October, the town had witnessed a torch rally on the same issue but today’s rally taken out in the noon was much bigger in size and was more vigorous. Citizen Rights Protection Co-ordination Committee (CRPCC), an umbrella organisation of rights activists in Assam, had convened today’s rally. 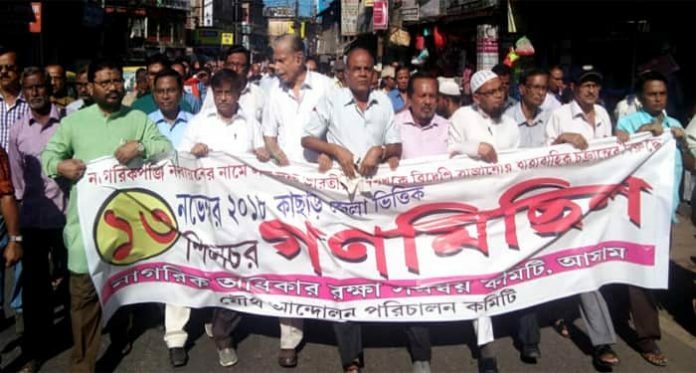 Led by CRPCC president and former vice-chancellor of Assam University, Tapodhir Bhattacharjee, the rally started from India Club Ground at Tarapur and concluded at National Highway Point after traversing through the main thoroughfares in the town. CRPCC had given a call to all political and apolitical organisations to join in the rally with or without their banner, provided they support the 12-point charter of demands raised by the rights body. Responding to this, political parties like Congress, CPI, CPI-M, CPI-ML (Liberation), SUCI, and the AIDSO participated in the rally. 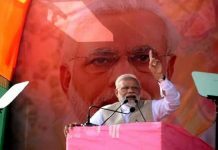 BJP stayed absent but members of some frontal organisations walked in the rally in their individual capacity. This apart, representatives of at least 20 civil society organisations participated in large numbers. 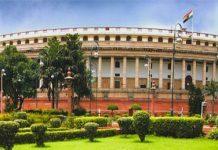 They include the Assam Bangali Chhatra Yuva Federation, which had called a bandh in Assam on 3 November against the massacre of five Bengalis in Tinsukia. According to eyewitnesses, some 3,000-people took part in the rally, which going by Silchar’s standard is nothing but “huge.” The participants shouted slogans against the bias in the NRC process and on the 12 demands. The demands include ~ deferring the NRC claim filing deadline by two months in view of the Panchayat polls in Assam, dropping the plan for re-verification of names that have already found a place in the draft list, treating any of the 15 Supreme Court approved documents as self-sufficient for authenticating citizenship, legal action against those filing false objection against inclusion of names, legal recourse for those dropped from the NRC, and abolition of detention camps, etc. 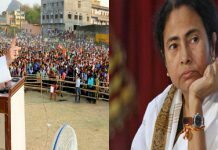 Similar centralised rallies are scheduled to be held in the two other districts of Barak Valley ~ at Karimganj on 15 November and at Hailakandi on 17 November.